In the ever changing landscape of publishing, Devil’s Due is expanding its strategy for several of its new titles to embrace a triumvirate of digital first editions, crowd-funding, and traditionally printed comics distributed through comic book shops. 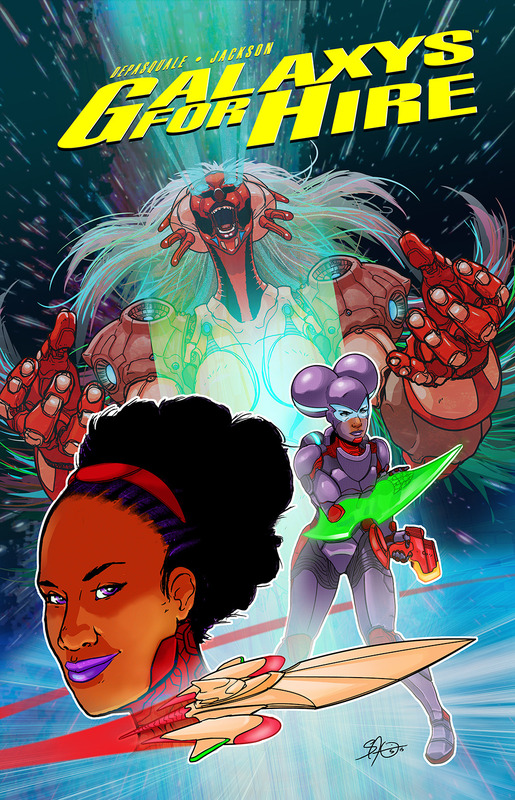 First to be released is the sci-fi action series Galaxys for Hire by Shawn DePasquale and Sherard Jackson: A series centered around two rivaling sisters, Tanna and Mallori Galaxy, trying to survive a rigorous life in space in the 51st century. From the explosion of comic-cons to the new boom in indie comics, to the rise of new direct-to-reader sales channels such as crowdfunding, Devil’s Due has positioned itself to go wherever the fans are, on a case-by-case basis, while continuing to build relationships with retailers and Diamond Distributors. The digital first program will see several titles released in digital format, first available from www.DevilsDue.net, followed by third party digital distributors such as comiXology and Drive-Thru Comics, and (for certain titles) to its crowd-funding campaign backers and additional marketing, all which serve as marketing to promote the comics in anticipation of print distribution through the comic book shop Direct Market and several large comic-cons. It should be noted that the company is still releasing comic books traditionally, without a digital-first component, as it always has. Already known for their huge presence as web-comics, Plume [by K. Lynn Smith] and the recently added Scorch [by Ashley Witter], are also published by Devil’s Due and will maintain their own independent web presence. Mercy Sparx [by Josh Blaylock, Matt Merhoff and various artists] starting with issue 8 – May 2015 (still scheduled for print release as solicited).